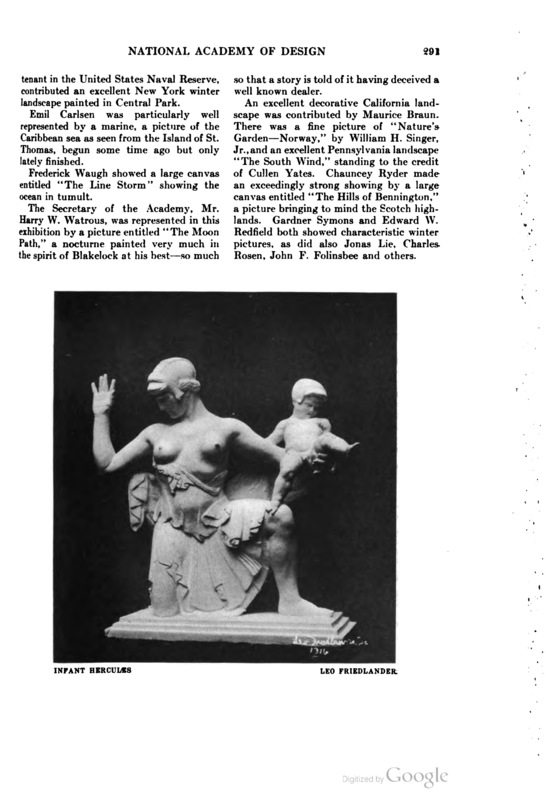 The American magazine of art [Art and progress], The American Federation of Arts, New York, NY, “The National Academy’s ninety-third annual exhibition”, volume 9, number 7, May, 1918, page 288-291, not illustrated. 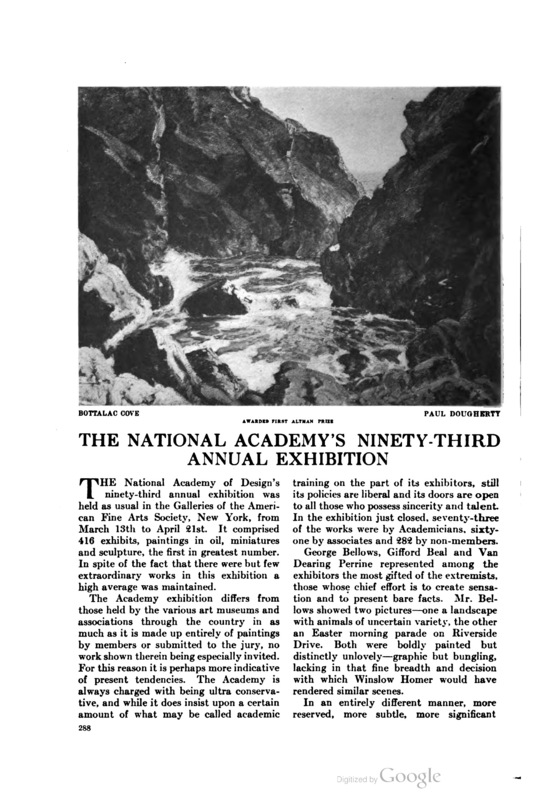 The National Academy of Design’s ninety-third annual exhibition was held as usual in the Galleries of the American Fine Arts Society, New York, from March 13th to April 21st. It comprised 416 exhibits, paintings in oil, miniatures and sculpture, the first in greatest number. In spite of the fact that there were but few extraordinary works in this exhibition a high average was maintained. by members or submitted to the jury, no work shown therein being especially invited. For this reason it is perhaps more indicative of present tendencies. The Academy is always charged with being ultra conservative, and while it does insist upon a certain amount of what may be called academic training on the part of its exhibitors, still its policies are liberal and its doors are open to all those who possess sincerity and talent. In the exhibition just closed. seventy-three of the works were by Academicians, sixty one by associates and 282 by non-members. George Bellows, Gifford Beal and Van Dearing Perrine represented among the exhibitors the most gifted of the extremists, those whose chief effort is to create sensation and to present bare facts. Mr. Bellows showed two pictures—one a landscape with animals of uncertain variety, the other an Easter morning parade on Riverside Drive. Both were boldly painted but distinctly unlovely—graphic but bungling, lacking in that fine breadth and decision with which Winslow Homer would have rendered similar scenes. of nature—work. Which attracted and at the same time retained interest. To this exhibition a group of western made notable contributions, were two painters among these was Walter Ufer, who was awarded the Thomas B. Clarke prize for his painting of Indians entitled Going East, painted undoubtedly in Taos. William T. Pearson, Jr., won the Saltus medal for one of his characteristic compositions 0f fowls and landscape—altogether decorative and engaging. Oddly enough, the. 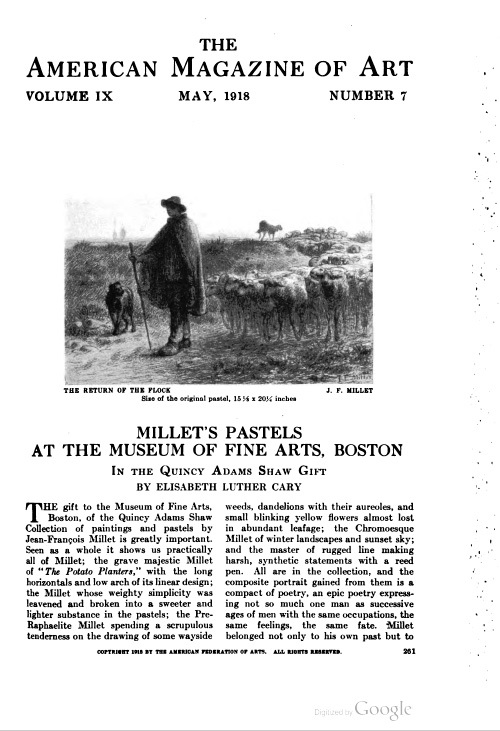 two Altman prizes for landscape were awarded to a marine by Paul Dougherty and a city picture by Childe Hassam, both. however, excellent. Mr. Hassam’s representing Fifth Avenue bedecked in flags in honor of the Allies was peculiarly timely. 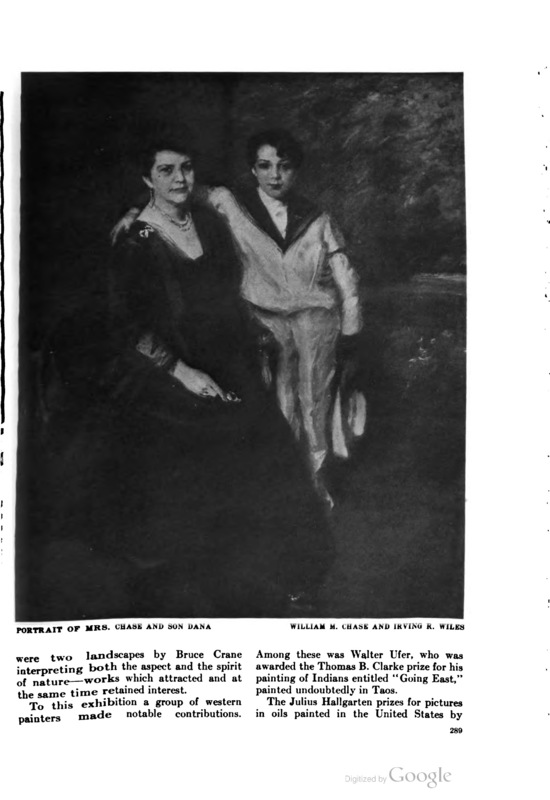 The place of honor in the Vanderbilt Gallery was given to a portrait of Mrs. Chase and her son, painted some years ago by William M. Chase and Irving R. Wiles—a work of collaboration, typical of both painters and yet not precisely like the work of either. Kenyon Cox and Albert Herter showed portraits of unique interest painted in the style of the old Italian masters with great elaboration of detail and smoothness of finish. The portrait by Mr. Cox was of his son’s wife, the portrait by Mr. Herter, of a man in a fur coat and cap. In strong contrast to these was Mr. Seyffert’s prize-winning portrait of his wife, painted with extreme breadth and unusual bravado. 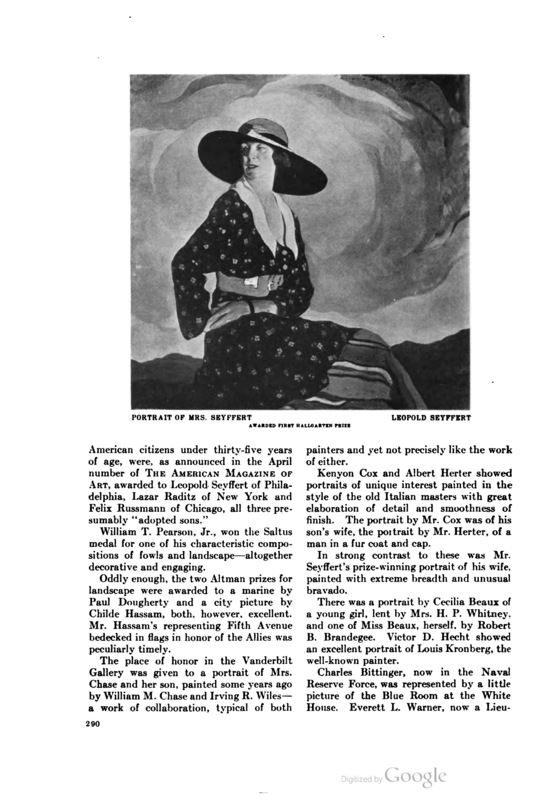 There was a portrait by Cecilia Beaux of a young girl, lent by Mrs. H. P. Whitney, and one of Miss Beaux, herself, by Robert B. Brandegee, Victor D. Hecht showed an excellent portrait of Louis Kronberg, the well-known painter. Charles Bittinger, now in the Naval Reserve Force. was represented by a little picture of the Blue Room at the White House. Everett L. Warner, now a Lieu tenant in the United States Naval Reserve, contributed an excellent New York winter landscape painted in Central Park. Frederick Waugh showed a large canvas entitled The Line Storm showing the ocean in tumult. the spirit of Blakelock at his best—so much so that a story is told of it having deceived a well known dealer.